Siri Guru Arjan Devjee Maharaj - Sachae Patshah is blessing us with this hukamnama today. When Satguru Arjun Devjee Maharaj was building the Saroovar of Amritsar; this is when they did oocharan of this shabad, when they spoke this shabad for the first time. Guru Sahibjee's older brother Baba Prithi Chand was upset that so many people were coming to Siri Guru Arjun Devjee that he was full of hatred for the Guru and he said to all had come to see him that the amrit jal - the immortal nectar which is being put into the sarovar will not stay. It will seep into the ground or fall away and that no one will go to Darbaar Sahib and all of this money that has been spent has been wasted. When the Sikhs first came and put amrit jal, from the wells, into the sarovar the water seeped away and fell away and the Sikhs were very sad and they came to Satguru Arjun Devjee Maharaj and did benti. Satguru Maharajee did Ardaas to Akal Purakh Sahib at Santokhsar Sahib and when the Sikhs put immortal jal back into the sarovar the sarovar started filling up with the grace of God. When Satguru Arjan Devjee Maharaj came to the asthaan of Darbaar Sahib, where Siri Harmandar Sahib is now, the ground was very very hard and no one could shovel the ground. The Sikhs were trying very hard but they couldn't break through the ground and make the place where the foundation stone of Darbaar Sahib was going to be laid. It was mid-afternoon towards evening and Satguru Sahibjee said to Sikhs, lets leave the seva here today and we will begin tomorrow so everyone went to their places. So next day amritvela Guru Sahibjee with many angelic beings, Satguru Arjan Devjee Maharaj in the form of a Sikh, in the form of a simple man and all these angelic beings also came in the form of men dressed in simple choley and dastaars and kamarkassey around them, came very early amritvela - around 1am to the place of Darbar Sahib and they started shoveling away at the place where the foundations of Darbar Sahib were going to be laid. On the other hand, Guru Arjan Devjee in their own roop sat through Aasa Di Vaar daa keertan with Sikhs such as Baba Budda jee and other great mahanpurakhs. So in one form - in the form of a Sikh - God Himself . Guru Sahibjee who is complete Akal Purakh Himself - because as we learn in Gurbani the Bhatts in their bani tell us that there is no difference between Siri Guru Arjan Devjee and Akal Purakh. Bhatt Naasraa jee says on Ang 1409 of SGGSjee bhan mathuraa kash bhaedh nehee gur arajun parathakha har - bhatt says that there is no difference between Guru Arjan Devjee and God. So God in the form of that Sikh, in the form of that simple man and many angelic beings, may saints, many great realized souls were working away to get the foundations stone ready, to get the place where the foundation was supposed to be laid ready. God Himself is standing, Karthaa purakh - this form of God which came to do seva. God Himself is standing with us. Another meaning of this is that when God Himself sits/stands in our heart, stands amongst us in our soul then nothing can happen to us. Even a hair from my head cannot be touched. Even though many people may have hatred towards Darbaar Sahib, Gurujee is saying that nothing can ever happen at this place because Kartha Purakh Himself came and stood. No matter what anyone tries to do vaal n vingaa hoaa - even a hair upon their head cannot be touched. Vaal n vingaa hoaa - another meaning could mean even bad thoughts cannot come into the mind when God himself abides there. Doing ishnaan here I have been raasae. Anyone who does ishnaan will be blessed with fal, blessed with success; spiritually and mentally. By meditating upon that Hari, by meditating upon Waheguru - all of my sins have gone. O Saints! Guru Arjun Devjee says to Baba Budda jee, pooran Brahamgyaani - O Baba Buddha jee, O sikho raamadhaas sarovar neekaa - this sarovar; pool of Guru Raamdaasjee is beautiful beyond any description. It is the most beautiful place on earth. Another meaning of this pangti is: O saints, the slaves of raam -their sarovar - their purifying pool; their sangat - the sangat of Akaal Purakh, the sangat of Guru. The sangat is not a place where idol conversations are held. Sangat is only that place where Naam simran is done. Gurujee gives us the definition of Sangat in SGGSJee Maharaj. How do we know what is sangat and what is not? Maharaj tells us is Siri Raag on Ang 72 of SGGSjee, sathasangath kaisee jaaneeai - how do I know what the satsangat is? Guru Sahibjee answers the question: jithai eaeko naam vakhaaneeai - where only the name of God is said, that is Sangat. Gurujee says raamadhaas sarovar neekaa - this pool of the sangat is blessed. Another meaning of this line is that the pool of the Guru, of the Guru's bani is beautiful and whoever bathes will be saved. Anyone who bathes here he will liberate his family. His soul would be liberated. Gurujee says, pause and think about this. Another meaning of this line is that whoever bathes in the sangat of Wahegurujee's jan is liberated, will same himself and many others. His/her soul will be saved. The whole world, every world - we can only see this world but the brahamgyaani mahanpurakhs can see beyond this world, there are many thousands of universes - paathaalaa paathaal lakh aagaasaa aagaas - as Guru Nanak Devjee says in Japjee Sahib. The many thousands of universes are all singing the praises of those Gurmukh pyaare in sachkhand. In Sachkhand the Gurmukh pyaare who sing Lord's praises they are praised by the Lord and all of His servants. Jai jai kaar jag gaavai - the whole world is singing the praises of these gurmukh pyaare who have meditated upon the Guru. 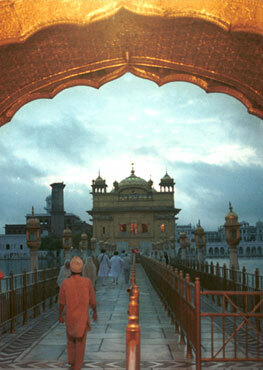 The whole world is singing praises of Amritsar - that Sachkhand on Earth. Whoever comes to Darbaar Sahib with sharda, with pyaar they man chindhiarrae fal paavai - in his/her mind whatever desires are there they will fal paavai - find the fruit of their wishes, they will be blessed with them. Those people who meditate upon Waheguru they will get their man chindhiarrae fal paavai - they will get the fruit of their mind's desires. Those who naae - who bathe in the Amrit Sarovar will become sehee salaamath - will become completely balanced, at complete poise, nothing will affect them, they will be beyond everything. Those who meditate upon the Guru, those who bathe in the Sarovar, who bathe in the sangat, who bathe in the Naam bani, they will be blessed forever as long as they apanaa prabhoo dhiaaeae. Whoever bathes in the pool of the saints - the sangat, the amrit sarovar of Darbaar Sahib, the sarovar of bani - whoever bathes in these things that humble being will be blessed with param gath - will be blessed with the ultimate state of liberation. That person will never die or come again in reincarnation whoever meditates upon the Name of Hari, name of Waheguru. Eihu breham bichaar s jaanai | Jis dhaeiaal hoe bhagavaanai | Only that person is blessed with knowing this braham bichaar - this understanding of Waheguru jis dhaeiaal hoe bhagavaanai - upon whom Wahegurujee is merciful. I have entered into the sanctuary of Satguru Nanak Devjee, prabhu Waheguru and all of my anxieties, worries and stresses have been taken away. So that being who meditates upon the Guru, upon bani, and in this amrit sarovar they are blessed with state of care freeness and they are blessed with entering the protection of Satguru Nanak Devjee and Waheguru.